The 2017 Sydney Peace Prize was awarded to Black Lives Matter on 2 November 2017 at the Sydney Town Hall in Australia. 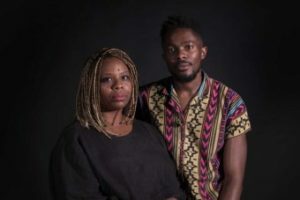 Receiving the prize on behalf of this organisation, described as championing a ‘movement for freedom, justice and dignity for all Black lives’, were the U.S. co-founder, Patrisse Cullors, and her Canadian counterpart, Rodney Diverlus. Patrisse Cullors and Rodney Diverlus. Photo: ABC News/Jack Fisher. ‘Black Lives Matter is in Australia to accept the Sydney Peace Prize, and meet with black Australians. During our trip, the thing that stands out to us most is that Indigenous Australians are facing some of the most horrendous living conditions in the world, sadly similar conditions to those in the US and Canada. Black Lives Matter is pertinent here in Australia and as we are having conversations with people, we are realising that. ‘When we started Black Lives Matter, we understood that this movement wasn’t just for the United States but one that would centre black communities around the globe. We don’t see this as a civil rights movement, we don’t see this as relegated to the United States but as a human rights movement which allows us to have a broader conversation about anti-black racism across the globe.